I’d wager if I’d have conducted the same search twelve months ago the picture would have looked a little different. And five years ago – significantly different. What does this matter? Well, just as the eyes are the windows to the soul, the job title is the window to the organizational zeitgeist (forgive me). Job titles offer a quick view on the importance of capabilities to organisations – a measure of what’s hot right now. And innovation is H.O.T.! Need further proof? OK, so if job titles don’t do it for you, perhaps financial commitment will. Gartner’s 2016-2017 CMO Spend Survey (subscription required) shows that, on average, 10.3% of marketing budgets are now allocated to innovation. The average marketing innovation investment has increased for three consecutive years. Furthermore, around one sixth of those surveyed in 2016-2017 have set aside more than 15% of marketing budget for innovation programs. So strong evidence that organizational commitment is being matched by financial commitment. And these are good indicators. But take care my friends, as recruiting a role, or allocating a budget line does not make an organization innovative. Furthermore, tagging budget lines against innovation doesn’t guarantee that those budgets actually fund true innovation programs. I would argue that innovation efforts should be focused on the outputs, not the inputs. As an organization, you are as innovative as the meaningful, valuable innovation you deliver to your customers (and employees and stakeholders). And, as such, innovation is very much in the eye of the beholder. 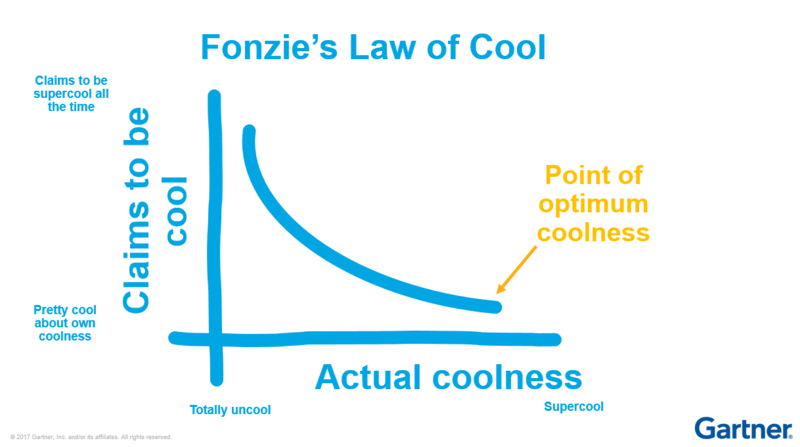 In short, the concept of innovation is like the concept of coolness – the more you insist you possess it, the less actually do (this is also known as Fonzie’s law). The danger is that, by appointing that role, or allocating that budget, you place a tick in the innovation box, allowing the organization to labor under the misconception that you’ve got it covered. But innovation is not a role or a budget line – it’s an organizational culture. A culture that accepts failure in the pursuit of learning and iteration. A culture that rewards both short-term optimization, and long-term transformation. A culture that lauds those that constantly question rather than constantly conform. So, by all means recruit the roles, and build the budget – these are important seeds of innovation. But ensure that these seeds don’t fall on fallow ground. Build the organization and culture that sustains innovation. Ensure your programs deliver upon the innovation mandate, using Gartner’s Innovation Matrix (subscription required). And, most importantly, just as the Fonz would say in his new position of Head of Marketing Innovation for the Fonzarelli Motorcycle Corporation, “don’t just say you’re cool, be cool”. I agree with the post that innovation is not a role or a budget line – it’s an organizational culture. Organization head’s must inculcate innovation as the culture of the organization and not look to buy innovation from hired people.